Second in our layman's-level series on evidence for a young Earth is bent rock layers. Geologists will give superficial explanations of "folding" and so forth, but when examined more closely, their explanations crumble and raise further questions — especially those hardened sedimentary rock layers that extend for miles. One place these layers can be seen is at the Grand Canyon. In many mountainous areas, rock layers thousands of feet thick have been bent and folded without fracturing. How can that happen if they were laid down separately over hundreds of millions of years and already hardened? If the earth’s fossil-bearing sedimentary layers were laid down over 460 million years, they could not be bent without breaking. Hardened rock layers are brittle. Try bending a slab of concrete sometime to see what happens! But if concrete is still wet, it can easily be shaped and molded before the cement sets. The same principle applies to sedimentary rock layers. They can be bent and folded soon after the sediment is deposited, before the natural cements have a chance to bind the particles together into hard, brittle rocks. The region around Grand Canyon is a great example showing how most of the earth’s fossil-bearing layers were laid down quickly and many were folded while still wet. Exposed in the canyon’s walls are about 4,500 feet (1,370 meters) of fossil-bearing layers, conventionally labelled Cambrian to Permian. They were supposedly deposited over a period lasting from 520 to 250 million years ago. 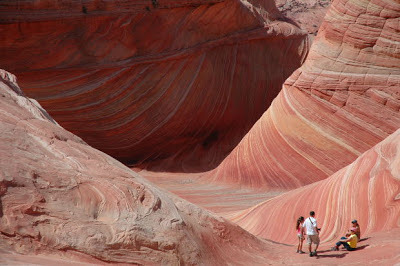 Then, amazingly, this whole sequence of layers rose over a mile, around 60 million years ago. The plateau through which Grand Canyon runs is now 7,000–8,000 feet (2,150–3,450 meters) above sea level. You can read the rest of "Bent Rock Layers", here. A more technical article is available at "Rock Layers Folded, Not Fractured".